We had Boo’s birthday party today. She’s been 6 for almost a month. I’m not actually completely unable to get it together (actually, I am, but this isn’t part of the proof). We just like to have her party in September, when people are actually around. 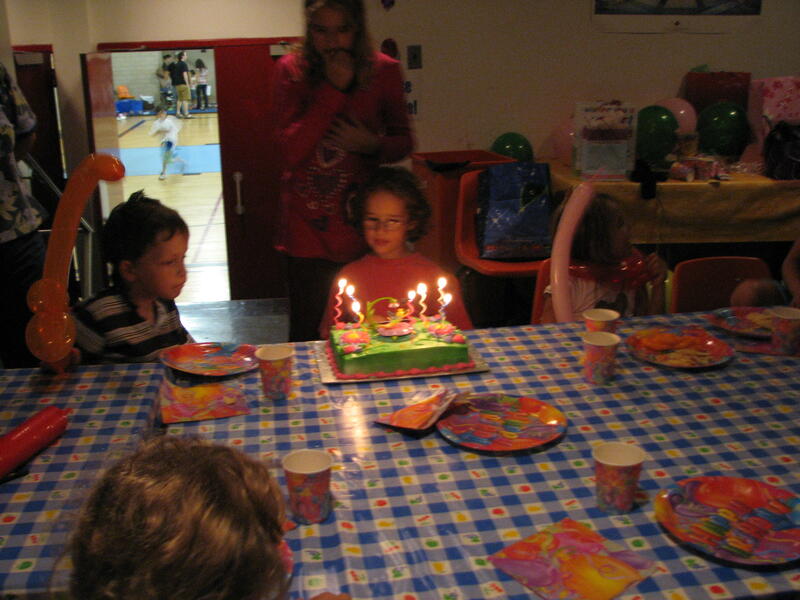 As it was, it was a fairly small party – 4 girls and 5 boys. She doesn’t like boys or play with them, your understand. Except for Zachary, David, Noah, etc. 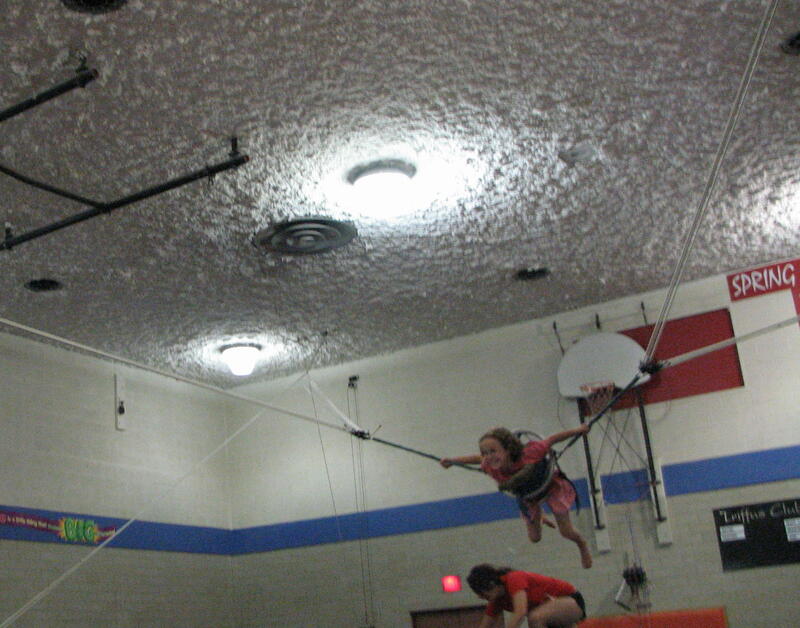 We went for a trampoline party. 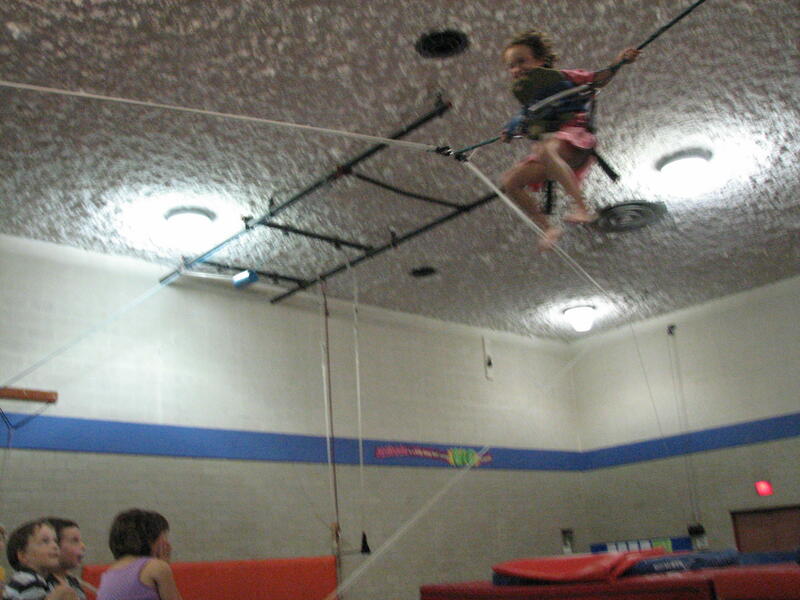 They got to do lots of jumping. Then, and this was what sold it for her, she got strapped into a big harness that didn’t actually fit that well, and reverse bungeed into the air. Does it get any more fun that this, I ask? No, it does not. It made me queasy just to watch. Having survived the dangerous part of the party, we retired to the ‘party room’ where we had cake and watched J attempt to put into action the newest addition to his magic show repertoire, balloon animals. He attempt to make a monkey and after the fourth balloon broke, yelled, “Who wants a sword?” The kids were smart and all agreed swords were good, and got them with no more balloon animal deaths. Other than that, my weekend has involved knitting. The arrival of fall weather (which then made a full retreat today) put me in the knitting frame of mind. Soapstone is summer and knitting is winter. 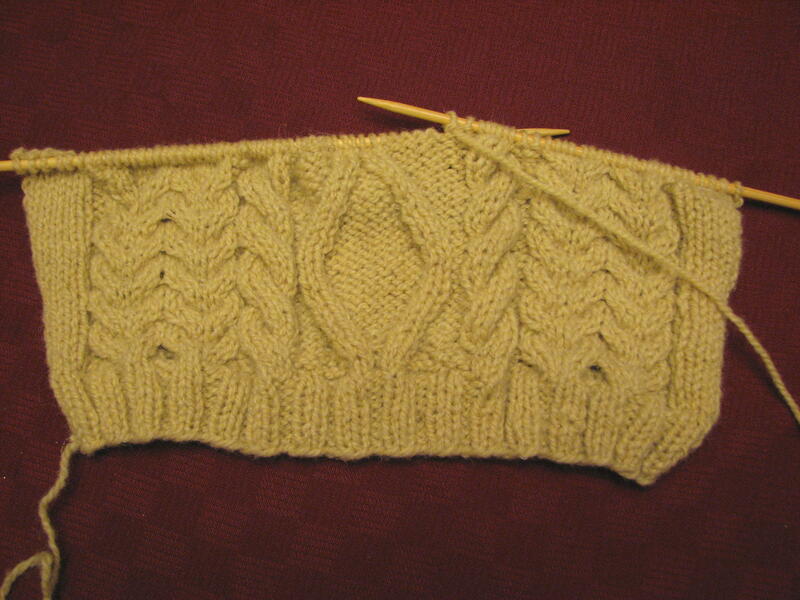 Knitting kind of got interrupted last year, after February, because by the time my hands worked well enough to knit, it was spring and back to soapstone. My mother got ahold of a great pile of oiled wool. This stuff hasn’t had the lanolin, or some such thing, taken out of it and so is heavy and waterproof. It has quite a strong, distinctive odour too, like sheep (clean sheep) and earth, maybe. I like it, my kids do not. Anyway, we’ve decided to knit fisherman’s knit sweaters for all the ungrateful children (hoping the smell will wash out somewhat). She started on the cousins and on Friday brought me wool to start on mine. Maya didn’t like what my mom had done for her cousin – too busy – so I modified the pattern to be less busy and take out some bobbles I hated, and started on one for Boo. If Maya likes that one, I might put the effort into one for her. Knitting with wool that heavy isn’t easy. This is how far I’ve gotten. The picture isn’t really as badly lit as it seems. The yarn isn’t dyed and is a natural wooly beige. Starting the sweater reminded me that I hadn’t finished a pair of mitts I was making for myself out of the same stuff, only I’m thrumming them for extra warms. 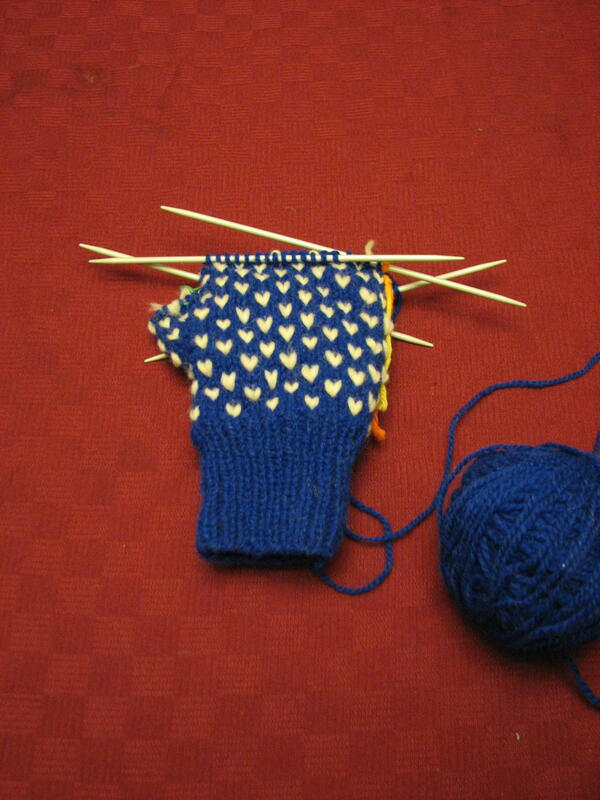 So I ditched the sweater last night and worked on the mitts instead. Both of these things have pushed aside the socks I’ve had kicking around all summer. 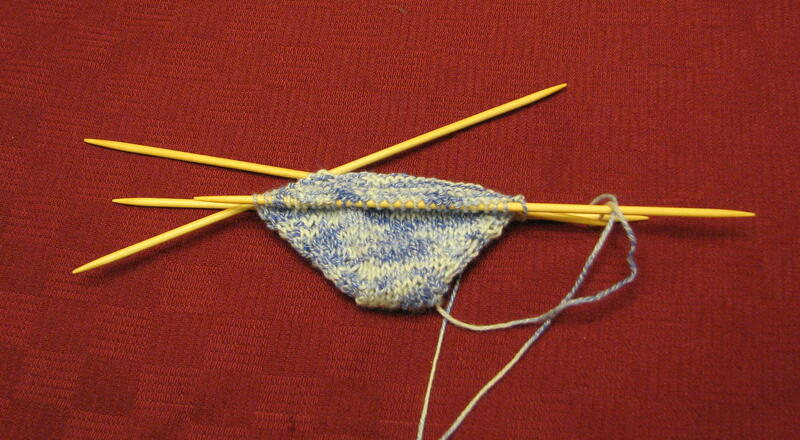 I decided to knit them toe-up, which isn’t very common, and have kind of been winging it. 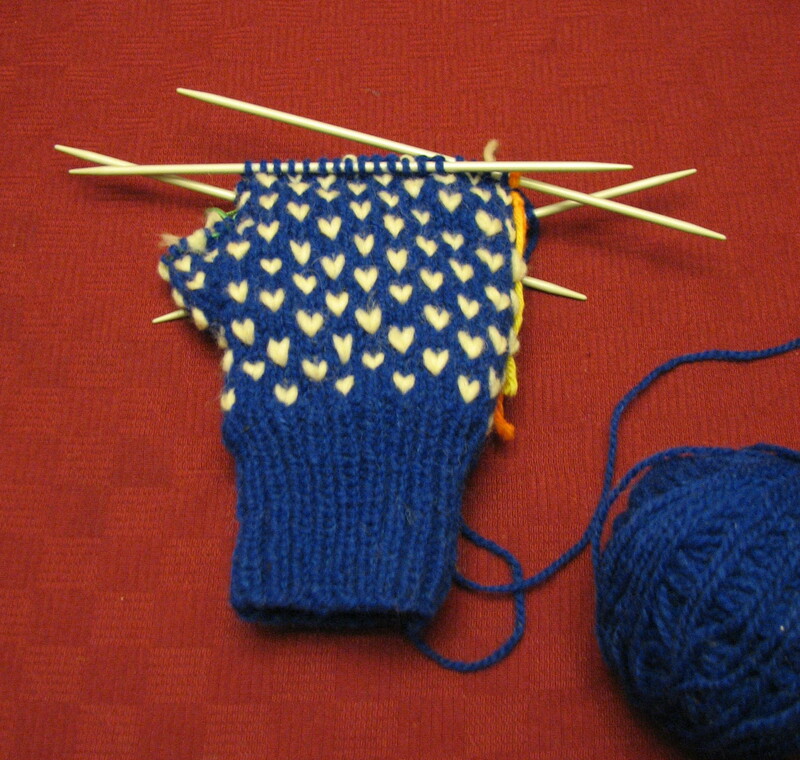 I knit much of one before I decided I didn’t like how the toe fit and started again. This is how far I’ve gotten. Having people guess what it is is the most fun part of these. The funniest guess came from J’s uncle, who figured I was going for knit condoms.